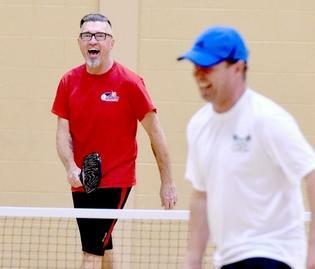 DESTIN — Locals and snowbirds gathered Saturday to play a game or two of pickleball at Destin United Methodist Church. “The sport was introduced to us about four years ago here by a snowbird,” said Colon Terrell, the Emerald Coast Florida District Ambassador to the USA Pickleball Association. Terrell teaches beginners every Tuesday and Thursday from 10:15 a.m. to noon year-round in the church’s Life Center. “It is a fast-growing sport with 400,000 pickleball association members, and it has already been entered to the seniors Olympics,” he said.